A year ago this week I lost my Mom to Alzheimer’s. 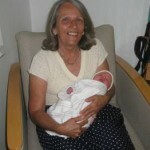 She passed away quietly in her sleep just a few days after Christmas and a week before her grandson, Luke, was born. At the time, her passing was a mixed blessing. We were at the end of a long, exhausting, heartbreaking journey. She was diagnosed with early-onset Alzheimer’s in 2005 at the young age of 58 – but looking back her symptoms started several years before. One of the cruelties of Alzheimer’s is early on my Mom was fully aware that she was slowly slipping into the depths of this cruel disease and she feared what she knew lay ahead. By the end, those fears had come to fruition, as she was unable to move, eat, or communicate without assistance. When she passed, we took a measure of peace knowing she would not want to continue in that state and she was headed to a better place where she would be reunited with her lost memories. When she died, I buried myself in the flurry of details and activity that comes with planning a funeral, burial, and the birth of our son. Reflecting back a year later, her journey puts much in perspective, and I hope I will remember these life lessons. My Mom’s story is not unique. Over 5 million Americans suffer from Alzheimer’s and it threatens to reach epidemic proportions by the middle of the century. We aren’t doing enough to prepare for the epidemic or fund research to find treatments and cures. Our health care system isn’t ready and the costs of care and impact on families and caregivers will be staggering. Having watched my Mom’s heartbreaking battle, I can’t help but be haunted by the fear of Alzheimer’s. I worry not only about going through the confusion, anxiety, and pain she went through – but I don’t want my kids to have to go through what I went through as a caregiver. That’s what motivates me to stay actively involved in the Alzheimer’s Association. I sometimes wonder with a measure of guilt if she somehow decided it was time to go for my sake. Being a caregiver for someone with Alzheimer’s is mentally, physically, and financially draining. Juggling her care, my family, and career was a constant challenge. 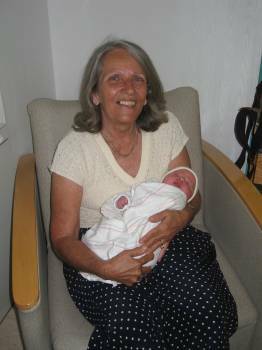 Although she was well into her Alzheimer’s journey when my daughter Alexa was born, I was glad she got to experience being a grandmother. With Luke’s birth around the corner, I was worried how we would add yet another child into the juggling act and it made me sad to know my Mom wouldn’t be aware enough to get to know him. Perhaps she felt the same and decided it was time. That would be like her. Her neighbor, Sharon, once told me my Mom was the “sweetest lady in the world – until someone messed with her kids, then it was watch out Mamma bear”! That’s a spot-on description of my Mom. Three weeks from now will also mark 15 years since I lost my father. Losing both parents creates a giant hole and emptiness that is hard to describe. I think having kids highlights that hole. There are so many reminders – so much you want to share with them, and so much you wish you could learn from them. It also makes me realize that along with my faith, family is everything. I am blessed with a beautiful wife and two amazing children. Since my brother joined the Army I don’t get to see him very often, but we are closer than ever. My Mom’s sister has become a second mother to me and grandmother to Alexa. Steph’s family has been a blessing as well. Having lost my father and been a caregiver for my mother by the time I met my wife, I am re-learning how to be a ‘son’ to her parents. I have often questioned why this was God’s plan for my Mom. I still can’t answer that question. But as I look back at some of the early successes I had in life, I believe God was equipping us with the resources to provide the care and assisted living facilities she needed. I don’t know what His plan is for me, but I know He’s at work in my life. Nothing makes you want to de-clutter your life like having to figure out what to do with deceased relatives stuff! Out of my parents’ lifetime of possessions, nothing more than a few pieces of furniture, photos, and my Mom’s quilts had any sentimental (or material) value. Having grown up with modest means, I used to find it hard to discard anything functional. Now I can’t stand clutter. Even with photos, less is more. It’s hard to hit ‘delete’ on those digital photos, but I’m trying to get into the habit of saving only our favorites. Having lost both my parents at a relatively young age, I no longer take my health for granted. For the same reason, I also know I can’t take tomorrow for granted. My Mom had recently gone back to school and learned to program. She had a job she was proud of and was happier than she had been for a long time when she lost it all to Alzheimer’s. My father’s dream for retirement was to live at the beach. He planned to work at a pier and spend his spare time fishing. He never got to live that dream. I need to do a better job of prioritizing how I spend my time. I want to make sure I don’t put off opportunities to spend time with my kids, travel, and realize my own dreams for tomorrow. I’m thankful that a year later, my memories of my Mom are of the strong willed, independent, loving person I knew before Alzheimer’s. As the years pass, I’m sure I’ll continue to reflect on her journey. Most of all I hope she knows how much she is loved and missed. Last month ATDC announced a new ATDC Select membership level and I’ve started to get questions and comments about what it means. Before proceeding I should add that my thoughts in this blog are my views and opinions, not necessarily those of ATDC! ATDC has gone through a lot of changes in the past 2 years. It has grown from 40 companies to more than 500 early stage companies ranging from concept stage to venture-funded and revenue generating companies. While that is unquestionably great for the Georgia economy and technology community, it has also been a challenge for ATDC to try to provide support to that many companies without diluting what has made it a leading accelerator for the past 30+ years. The ATDC Select membership group is new, but it is actually what much of the technology community already knows ATDC to be – an incubator that Forbes magazine recognized as one of the top 10 incubators in the world. The ATDC accelerator has helped launch over 100 successful companies that have raised over $1 billion in outside financing. The companies residing in the incubator have raised over $40 million this year alone. The way I see it – the ‘Select’ membership isn’t what’s new – it’s the focus on developing scalable programs for the open membership that was launched 2 years ago that is new. Some will insist a largely taxpayer funded organization should provide ‘equal access to all’ and the Select program is exclusionary. I disagree. The over riding mission of ATDC is economic development. A few years ago the US Department of Commerce’s Economic Development Administration released a report stating that incubators are an effective and efficient way of creating jobs. The study found incubators are “More effective than roads and bridges, industrial parks, commercial buildings, and sewer and water projects.” In fact, incubators provide up to 20 times more jobs than local infrastructure projects at 1/20th of the cost! But that is only true if the incubator is able to provide the coaching, services, and space that make a difference in the success of the start-ups they are supporting. ATDC has limited resources – money, space, and team members. The best use of those taxpayer funded resources is to apply them to the technology start-ups that are poised for rapid growth and can most benefit from the support, and build programs to help the broader start-up community get to that point. That does not mean ATDC is trying to ‘pick the winners’ – anymore than an advanced class in a public school is picking the students most likely to succeed. ATDC will evaluate companies for the Select program by looking at the team, the technology, the market, and most importantly the ‘fit’. Since these are often new technologies and new markets, it’s a highly subjective and in-exact science. ATDC helps companies grow rapidly and ‘graduates’ them when they are sustainable companies. If ATDC team members don’t think they can help them get to the point they are fundable and sustainable, they can’t help them succeed. This also doesn’t mean that ATDC won’t continue to focus on the open membership companies. Quite the contrary. The broad technology community will find no bigger champions than Stephen Flemming, the VP of the Enterprise Innovation Institute that oversees ATDC and Nina Sawzuck, the GM of ATDC. Stephen championed the effort to open up ATDC membership two years ago – and he remains committed to serving the broader community. ATDC will continue to develop programming, coaching, and networking opportunities for all ATDC members. The hope is many of them will progress to becoming ATDC Select Members. The goal for both groups is the same – coaching, connecting, and community for Georgia’s technology entrepreneurs. The new ‘Select’ membership group will launch on January 3rd, 2012. I think it’s a great move. Will there be start-ups that could benefit from ATDC and are qualified to be part of the Select group that don’t get in? You bet. I’m sure ATDC will be looking for ways to increase it’s resources to expand the program to serve more companies. But for the companies that are chosen for the Select program, ATDC will be able to provide the customized level of support to help them succeed. More success stories are good for Georgia’s economy. More successes will attract more venture investment in Atlanta, create more jobs, grow the local talent supply, and benefit the entire technology community. The Select designation will differentiate those companies and signal to partners and the investment community that those companies are getting help and mentoring that will help them succeed. The initial ATDC Select companies I’ll be supporting are Brightwhistle, Digital Assent, PlayOn Sports, Provider Web Capital, SecureHealthPay, Simple C, and Soneter. All great companies with terrific CEOs – I look forward to working more closely with them. Kudos to Stephen and Nina for making this happen. I met with an entrepreneur this week with a well thought out idea for a new business. She had done a lot of homework. She knew her market, had lined up friends and family to invest, had talked to customers, and had a solid vision of her offering. Looking for help on how to get the product built, she pulled out a huge roll of newsprint with her detailed product design. It was an impressive document – and to build it as laid out would be a huge, expensive undertaking. I didn’t spend much time looking at the document. Instead, I asked her what were the key features to test the idea and introduced her to the concept of Minimum Viable Product (MVP). The ‘MVP’ gets talked about a lot here at ATDC and is one of the most important strategies for startups. Eric Reis, author of The Lean Startup, defines the minimum viable product as “just those features (and no more) that allows you to ship a product that resonates with early adopters”. Following this approach gets your product in users hands faster and minimizes time wasted on features no one cares about. It’s subjective, not scientific. It’s an iterative process based on customer feedback that allows you to test your idea and pivot to hone in on a solution customers will adopt and pay for. Sometimes the MVP isn’t even a functioning product. It might be a demo, a presentation, or screenshots. Before I helped my wife build her ecommerce store, we tested keywords on Google Adwords to see if the products would generate interest. When we decided to move ahead we did so with a limited number of products across various categories until we find out what sells. For more on MVP, sign up for ATDC’s Customer Discovery program and see Eric Reis’ presentation here.